Body Attack CREAZ XPAND is a pre workout booster for more pump and plump muscles. ≙ 19,99 € ✔ Delivery time 1-3 working days within Germany. Content is sufficient for use according to our recommendation for 20 day(s). 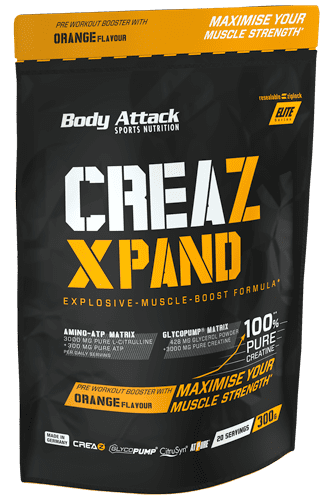 Body Attack CREAZ XPAND is a new generation pre-workout booster, as it´s formula provides your body with all performance-boosting nutrients required for ensuring an effective workout. The EXPLOSIVE-MUSCLE-BOOST formula will not only make your muscles stronger during workout, but also help develop fuller and harder muscles. In particular the glycopump matrix with 100% creatine supports the ATP production in the muscles, enabling you to lift higher weights and complete more reps. This will help you push your performance limits and bring you to a higher level. Your muscles will feel fuller and harder during workout as the increase in strength* ensures that they are well supplied with blood. Further innovations contained in this new generation booster are the two branded substances Citrusyn and CREAZ, which supply your body with 100% creatine and citrulline. Conventional pre-workout boosters in comparison contain considerably lower concentrations of creatine and citrulline as these are provided in other compounds such as creatine monohydrate and citrulline malate. Citrulline is a popular amino acid which is often used in boosters. If taken regularly, the contained CREAZ, which supplies 100 % pure creatine, supports a higher performance during speed strength training. Consequently, your muscles will be able to manage more reps and lift higher weights. This is also due to the generation of adenosine triphosphate (ATP), as the daily intake of 3 g creatine increases the ATP generation of the muscles during speed strength training. Under intensive stress, the muscles always require ATP and creatine. For experienced recreational and competitive athletes who wish to provide their muscles with sufficient creatine over an extended period of time. For advanced power athletes who wish to achieve greater levels of strength performance and endurance during training. For power endurance athletes who wish to produce more repetitions and have more power in their workouts.